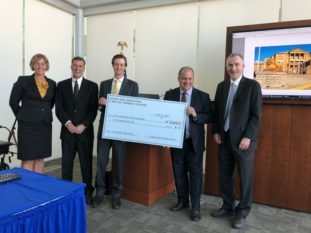 Members of the P. Mahoney (Rockford, IL) Federal Bar Association present a check for $10,000 for the Prisoners’ Rights Program to the Northern Illinois University College of Law. Pictured (from left): Jana Brady, U.S. Magistrate Judge Iain Johnston, Jordan Emmert, NIU Law Associate Dean Marc Falkoff, and Interim Dean Mark Cordes. Northern Illinois University law students will have another opportunity to gain valuable real-world experience when they represent prisoners in federal court beginning this fall. On Friday, June 29, 2018 the NIU College of Law and the P. Michael Mahoney (Rockford, IL) Chapter of the Federal Bar Association announced their partnership and launch of a Prisoners’ Rights Program during a special ceremony at the Stanley J. Rozkowski United States Courthouse attended by Chief Judge Ruben Castillo and Magistrate Judge Iain Johnston from the United States District Court, Northern District of Illinois. Magistrate Judge Johnston also praised the program and what makes it so unique. “NIU Law students, under supervision and guidance, will try a federal civil case. There are attorneys and litigation partners in large law firms in Chicago who have never tried a federal civil case.” Judge Johnston will work closely with the program, assigning appropriate cases to the students. Associate Dean Marc Falkoff was instrumental in working out the intricate details to bring the program into fruition. “This will be an exciting and remarkable training opportunity for our students to learn about the federal trial process from start to finish,” said Falkoff. “The Prisoners’ Rights Program will be a hybrid between a clinic program and externship,” Falkoff explained. The students will be supervised by adjunct professor and Rockford attorney Lisa Jensen and will handle cases involving allegations of civil rights violations. The students will have the cases from the beginning including filing court papers, interviewing the client and witnesses, drafting interrogatories, and eventually conducting the trial in front of a jury. NIU Law alumnus and Rockford attorney Rene’ Hernandez (’90) also played a pivotal role in creating and crafting the Prisoners’ Rights Program. He was vice president of the Mahoney Federal Bar Association when the idea was conceived a couple of years ago, and during this time, he has worked closely with the law school to develop the program. Rockford native Alonte’ Holliday is one of six third-year law students who will participate in the inaugural program. He has already gained a lot of valuable experience during law school through coursework, trial advocacy competitions, and from his involvement in the Criminal Defense Clinic. These experiences, along with his passion to be a public defender, led to his decision to apply for the program. “There are a lot of people, especially those that are incarcerated, who don’t know where to turn. I want them to know that they are still human beings that deserve to have someone in their corner fighting for their basic human rights,” Holliday remarked. The Prisoners’ Rights Program will add to the list of incredible experiential learning opportunities offered by the NIU College of Law for its students. The Civil Justice Clinic and Criminal Defense Clinic also located in Rockford, IL along with the Health Advocacy Clinic located in Aurora, IL are all a part of the law school’s history of public service and mission to provide hands-on experience for students to advocate on behalf of real clients. “We would like to thank the Mahoney Federal Bar Association as well as the Court for their partnership and support of this significant and vital new program. Our students are excited for this tremendous opportunity and we are confident that it will be a great success,” remarked NIU Law Interim Cordes Mark Cordes.